As a young whippersnapper, my brother first got me addicted to paper crack around Ice Age. Around that time, I was already an impressionable nerdy kid who loved classic Roman and Greek myths and legends (which is no surprise that the lore of Theros has become one of my most favorite sets, right behind Tempest). I had no concept or rarity or value and I remember throwing all my garbage cards (silly things like Bazaar of Baghdad, who wants to discard their own cards???) 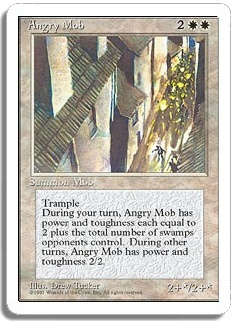 inside of a shoebox and prizing cards like Angry Mob and Bird Maiden. I just knew that I loved the idea of using beautiful pieces of art to game with. I never got into competitive magic until around Invasion block, where I started to learn how to draft and play in some constructed events. Nothing was ever DCI sanctioned, but I remember just opening packs and coming up with thousands of ways to make a Darkest Hour deck. It was to this day, what I call the golden age of magic, the game was at its best. As I aged, my tastes in cards were refined and I started going to prerelease events, the first one I recall being in Anaheim where everyone, including myself, was trying to grab a hold of Darksteel Collossus back in a set so aptly name, Darksteel. By this time most of my friends from high school got bored with magic, and I ended up going to shops to find new people to play magic with. This continued for years, playing with incredibly awesome people, fantastic stores, and the best communities I could ever imagine. When I headed to Korea, I nearly forgot about magic entirely until I fumbled across a shop that resonated the old feelings of magic once again. One thing about Korea that is definitely different is that everyone is incredibly competitive, even at the FNM’s where I was used to seeing lots of new and vet players creating a fantastic array of different decks. A bit later, they started publishing cards in Korean and the community seems to have grown with more shops opening up each day. Hopefully, some of the wisdom I have picked up over the years will lead to an enjoyable blog. Thanks for stopping by and if you’re ever in the neighborhood, drop me a line.